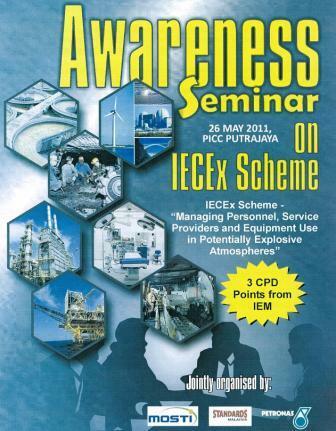 On 26 May 2011, I was successfully attended the “Awareness Seminar on IECEx Scheme”. This seminar was jointly organized by Standards Malaysia, MOSTI and Petronas at PICC, Putrajaya. Institution of Engineers Malaysia (IEM) also awarded this seminar with 3 CPD hours for IEM Members that attend this seminar. IECEx Scheme, under the purview of International Electrotechnical Commission System (IEC) for Certification to Standards Relating to Equipment for use in Explosive Atmosphere (IECEx System) is a scheme that covers the certification to standards related to apparatus for explosive atmosphere and provides an internationally accepted means of demonstrating professional technical services. The “Ex” is an internationally recognised abbreviated term for explosion-proof equipment and installation in an explosive atmosphere. It is required for processing flammable liquids, vapours, gases or combustible dust industries to use certified equipment and services in the facilities. IECEx provides a “Conformity Assessment Tool” confidence that equipment and services covered by an IECEx Certificate meets the specified requirements. Here I shared the tentative with all of you.